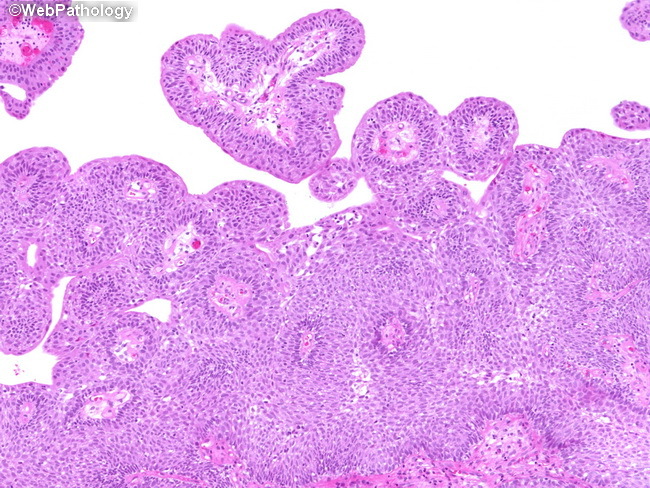 The endo- and exophytic components of this urothelial neoplasm can be easily appreciated in this image. Urothelial carcinomas (and LMP) tumors with predominantly inverted growth pattern have to be distinguished from inverted papillomas. Lack of exophytic component, absence of cytologic atypia and destructive stromal invasion, and the absence of irregular nests with solid areas favor the diagnosis of inverted papilloma.